I’m going to agree with George Malik here and just call Mike Green’s new contract official. According to Shawn Horcoff, the Wings have inked Mike Green to the much-discussed 2-year extension. Expect the press release today or tomorrow. Bob McKenzie had previously nailed down the financials of a then-unconfirmed deal. The move was long-rumored but I can’t say I’m thrilled with it. With Xavier Ouellet having been bought out and Green brought back, the Red Wings have six defensemen on their roster for next season. Seven if you count Luke Witkowski. Dennis Cholowski, Filip Hronek, and Joe Hicketts have all been discussed as possibly ready to jump to the NHL. The Red Wings have said that they want to get their youth more ice time. How are they going to do that with six guys already on the roster? Yes, they could move Nick Jensen. That’s a possibility that’s been rumored for most of the summer. If they do, it opens up one spot for three players. It could have been two spots for three players. It’s just not necessary and it’s frustrating to see the Wings organization once again talking about playing the kids but not leaving open roster spots available to them. The Red Wings made official on Friday something that had been rumored for weeks: The hiring of former Penguins and Sabres head coach Dan Bylsma as head coach. UPDATE: Detroit #RedWings EVP and GM Ken Holland announced today that the team has hired Dan Bylsma as an assistant coach. It seemed somewhat inevitable once the Red Wings cut ties with John Torchetti that Grand Haven-native Bylsma would come to Detroit if he couldn’t land a head coaching gig. I like the move. That’s partially because every time the Wings’ coaching staff has an opening I worry that they’ll just bring in a former Red Wing who doesn’t have any coaching experience. It’s also because this gives Detroit a clear backup plan if the team struggles under Jeff Blashill this season. Coaching isn’t like goaltending, where you might bring in a veteran to backup a struggling younger player to light a fire under him. Blashill isn’t going to become a better coach just because Bylsma is waiting in the wings (though he might by learning from Bylsma, which is a whole other thing). But if the Red Wings don’t turn things around and if management decides it’s time to move on from Blasill, Bylsma isn’t a bad option to turn to when that comes. The Detroit Red Wings will face a familiar slate of opponents during the 2018 preseason, with home and away matchups against the Boston Bruins, Chicago Blackhawks, Pittsburgh Penguins, and Toronto Maple Leafs. The last time the Red Wings faced a team other than those four in a preseason game was 2011, when the Philadelphia Flyers were on their exhibition slate rather than the Bruins. Detroit was to face Washington in the 2012 preseason that was lost to the league’s lockout of the players. There are a handful of cities that often pop up in rumors regarding NHL relocation or expansion. Quebec is one, with their recent expansion bid partially hindered by the NHL’s geographic imbalance. Seattle is going through the expansion process right now and is expected to be awarded the league’s 32nd franchise. Houston, with a new owner for the NBA’s Rockets who is receptive to an additional tenant at Toyota Center, has jumped into the discussion of late. And then there’s Portland, Oregon. Portland, home of the Western Hockey League’s Winterhawks, has sniffed at the NHL twice in recent memory. In the late 1990s, Microsoft co-founder Paul Allen – owner of the NBA’s Portland Trailblazers -, backed out of an expansion bid in the round that led to new NHL teams in Nashville, Atlanta, Columbus, and Minnesota. Just a few years ago, the Arizona Coyotes were rumored to be eyeing the Allen-controlled Moda Center as a landing spot as their (still ongoing) arena issues in Glendale seemed to be coming to a head. Through spokespeople, Allen has stated that he has no interest in pursuing an expansion franchise for Portland. However, if one became available for relocation, he would have interest. Additionally, Winterhawks owner Bill Gallacher has indicated interest in NHL ownership. Which brings us to a batch of ten internet domain names registered on Thursday by the Portland Winterhawks. Four of them seem relatively benign. You could make the case that hockeytownpdx.com, portlandhockeytown.com, playhockeyoregon.com, playhockeyportland.com could all be used in relation to the Winterhawks or other community initiatives (though the Detroit Red Wings might have something to say about a couple of those). A fifth – hockeytoportland.com – would look innocent coming from anyone other than the Winterhawks, as they’ve already brought hockey to Portland. That’s five domains making reference to the National Hockey League coming to Portland, all registered by the Portland Winterhawks. This is hardly confirmation of something coming. As the Winterhawks do not control Moda Center, this would look a lot more convincing if the domains had been registered by someone affiliated with Paul Allen’s group. That said, the Coyotes’ arena issues are still unresolved, the Calgary Flames have threatened to move without a new arena, Allen is interested in a relocated NHL team, and now we have domain registrations tied to Portland’s existing team – whose owner is from Calgary and who is already a tenant at Allen’s arena. It could be nothing. Or it could be a sign of the NHL’s next franchise move. Note: This is a non-hockey post but ties into the work I did looking into possible names for the team that became the Vegas Golden Knights and the NHL’s probable future Seattle franchise, so I’m publishing it here anyway. The Las Vegas 51s of Minor League Baseball’s Pacific Coast League are adopting a new name next season to coincide with their move into a new stadium. I hadn’t been paying much attention to this as I’m not much of a baseball fan, especially not of minor league teams on the other side of the country and not affiliated with any of my local teams. The tools that I developed while attempting to determine the name of the eventual Vegas Golden Knights and Seattle’s seemingly-inevitable expansion team are still running, still focused on Las Vegas, and hit on something interesting today. Yesterday, June 6, a lawyer with The Howard Hughes Corporation – owners of the 51s and their new ballpark in Summerlin, NV – registered a total of sixteen domains related to the Las Vegas Aviators. Additionally, a related Twitter handle – @lvaviators – shows as having been registered in June of 2018. That account has yet to Tweet or update their profile but has a name of “Las Vegas Aviators.” Ownership of the handle cannot be confirmed. If this is indeed the team’s future identity, the name Aviators would tie in to Howard Hughes himself and the pilots at nearby Nellis Air Force Base. As far as I can tell, The Howard Hughes Corporation has not registered any other baseball-related domains. Update, 6/10 1:30 PM: It would appear that there is a Facebook account for this new team name, too, as @TheLasVegasAviators is classified as a “Sports Team.” There’s also an Instagram user with the name “lasvegasaviators.” Of course, this could be someone not affiliated with the team. Update, 6/11 2:00 PM: After SportsLogos.Net picked up our story, I was inspired to give the USPTO database another check. It turns out that a ton of trademarks for Las Vegas Aviators were registered on June 6, the same day as the domains were acquired. The trademark database usually takes a few days to update, so it’s not a surprise that we didn’t see this sooner. 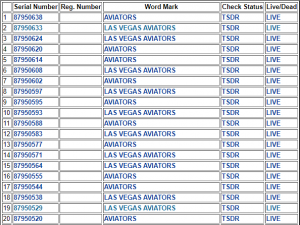 A list of Las Vegas Aviators-related trademarks filed on June 6.